James Edward Dalton was born on 17 October 1930 in New York City, NY. He is a graduate of Brooklyn Technical High School. He graduated from the U.S. Military Academy in 1954 and was commissioned as a Second Lieutenant in the U.S. Air Force. After completing pilot training in 1955, Dalton joined the 76th Air Transport Squadron at Charleston AFB, SC, serving as an Aircraft Commander until he entered the University of Michigan in 1958. After receiving a Master of Science degrees in Aeronautical and Astronautical Engineering, and Instrumentation Engineering from the University of Michigan in 1960, he served as a Project Officer in the Guidance and Control Directorate of the Ballistic Systems Division, Air Force Systems Command at Los Angeles Air Force Station, CA. He was responsible for the development of the operational targeting programs for the inertially guided SM-65 Atlas, Titan and LGM-30 Minuteman intercontinental ballistic missiles. Dalton attended the Air Command and Staff College during the 1964-65 academic year and was then assigned to the 374th Tactical Airlift Wing at Naha Air Base, Okinawa, where he served as an Aircraft Commander, Instructor Pilot, Flight Commander and Wing Executive Officer. During this assignment, he served in Southeast Asia as a C-130 Hercules Commander, Operations Officer and Deputy Commander of C-130 Operating Locations. From May 1968 to May 1969, he was a Project Officer in the Missile Division, Office of the Deputy for Strategic Forces, Deputy Chief of Staff, Research and Development, Headquarters U.S. Air Force, Washington, DC. While there, he was the Program Element Monitor for the Advanced Intercontinental Ballistic Missile Technology Program. He then attended the Industrial College of the Armed Forces, graduating in June 1970. He was assigned as Chief, Qualitative and Quantitative Analysis Branch in the Office of the Assistant to the Chairman, Joint Chiefs of Staff for Strategic Arms Negotiations from June 1970 to August 1972. In this capacity, he served with the U.S. Strategic Arms Limitations Talks Delegation as an adviser to the principal military delegate. Dalton was Vice Commander of the 438th Military Airlift Wing, McGuire AFB, NJ, until May 1973. He then took command of the 39th Aerospace Rescue and Recovery Wing at Eglin AFB, FL, where he was responsible for the rescue operations of seven squadrons and 14 detachments located in Europe, Iceland, Greenland, Alaska, Panama and the U.S. As many as 100 aircraft of five different types were assigned to the wing. During his tenure, the Wing received the Air Force Outstanding Unit Award and the Military Airlift Command's Distinguished Wing Flying Safety Award for 1973 and 1974. 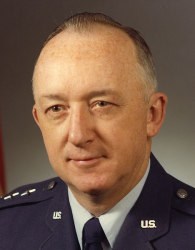 In February 1975, he become Commander of the Air Reserve Personnel Center in Denver, CO, where he was responsible for personnel support for the Air Force Reserve and members of the Air National Guard not on extended active duty, and personnel support for mobilization of the Air Reserve Forces. From November 1976 to May 1977, he was Deputy Director of Concepts in the Office of the Deputy Chief of Staff, Plans and Operations at Air Force Headquarters. In June 1977, he was assigned to the Organization of the Joint Chiefs of Staff and served as Deputy Director for Force Development and Strategic Plans, Plans and Policy Directorate. His responsibilities involved a broad range of national security issues. In July 1978, he became Vice Director of the Joint Staff and in July 1980 he was named Commandant of the Industrial College of the Armed Forces. He served as Director of the Joint Staff from July 1981 through July 1983. On 1 August 1983, Dalton was promoted to the four-star rank of General and assumed duty as the Chief of Staff of the Supreme Headquarters Allied Powers Europe (SHAPE). General Dalton retired from the Air Force on 1 July 1985. During his service, he became a Command Pilot with over 5,400 flying hours. In 1998, he was inducted into the Brooklyn Technical High School Hall of Fame.